Dragon Age II provokes conflicting emotions. On the one hand, BioWare’s flare for writing culminates in intriguing moral dilemmas and complex character relationships. On the other hand, flawed battle structures, rehashed dungeons and flat out bad design decisions put a gamer’s loyalty to the test. I love that Dragon Age has always been about a customized storyline experience. What I most love, however, is that with all the options and possible storyline deviations, I’ll be sitting down with gamer friends to discuss every one of our respective decisions for comparison. However, there are a great many flaws in Dragon Age II. Probably the most irksome of these how disjointed the main story arc is from the rest of your experiences. While the content for an interesting, cohesive storyline is there, you’ll have to dig through the threads to string them together. The first half of the game feels like a slow build up to what gamers will have been expecting: becoming the Champion of Kirkwall. This has always been spouted as the setting for DAII, and the initial quests all feel like fillers before you can finally reach this point. Fortunately, the storyline touches on a conflict I always hoped would be more prominent in the first title: that of the Templars’ questionable forms of protection of the Circle of Mages. In Dragon Age I, we saw hints of a discomfort and possible rebellion due to the mistreatment of mages. The Circle was seen to be a prison that would easily force Tranquility upon mages deemed dangerous. Both sides of the dilemma have supporters, as well as valid arguments to offer. The complexity of the issue, and of the decisions at hand, make that story arc one of the more intriguing ones. I often found myself staring at a dialogue tree attempting to determine what response would elicit the most accurate result I wanted. Characters’ reactions to your decision-making don’t always go as planned, but you quickly learn the lesson that you cannot always appease everyone. This connected with reality in that we are all subjected to the task of making decisions on a daily basis, and although we (hopefully) all strive to make that decision to the best of our abilities, the outcome won’t always be the positive result we strove for. The same can be said of decision-making in Dragon Age II. Unfortunately, there was still a lot of depth to the storyline that was left fairly undiscovered. There were so many story arcs I wanted to learn more about. Namely, Flemeth was a prominent figure in Dragon Age: Origins who made a brief return in the sequel. She’s powerful, clearly wise beyond any one's comprehension, and very mysterious. She caught my attention from the instant she engaged me in clever banter. However, Flemeth remains the elusive witch in DAII. I have a thousand questions about Flemeth, and a storyline centered on the exploration of that could even have sufficed. The tale of civil strife and calamity has been so rehashed in both this franchise and others that it has left a stale taste by now. I wanted something fairly new to explore. Unfortunately, those aspects of the storyline were not the only things rehashed in BioWare’s action-RPG. You’ll find yourself navigating the same maps and dungeons tirelessly. It gets to the point where you can predict where spiders will “unexpectedly” crawl down on top of you, making the dungeon raids more laborious than exploratory. What’s worse is the limitation of the world in DAII itself. You consistently run back and forth between areas just to hand in quests and pick up equally trite ones. There is no fluidity between your quests. I began to get flashbacks to my time with World of Warcraft when I’d depend on QuestHelper to lead me blindly from quest to quest based solely on ease of location. Rather than be motivated to explore the next series in a quest line, I wanted to complete quests in the most efficient manner possible, and I therefore would select the areas that would allow me to complete the most quests at a time. The entire Dragon Age II map is open to your exploration. Imagine instead if the storyline guided you through the areas in a predetermined way, while still of course allowing you to revisit previously discovered areas as you please. The entire storyline would have felt more cohesive with quests that follow a particular suit rather than a random amalgamation. As it stands, I felt like I was consuming unrelated, bite-sized stories in a random order. Quests became more of a laundry list of tasks rather than part of an enthralling storyline. To add insult to injury, the maps were never that intriguing themselves, either. Much of the outside of Kirkwall consists solely of a maze of trails with not much else besides a dungeon or two to explore. That meant that being sent to the outskirts for other quests felt like a chore. Many areas felt like pathways rather than locations you could explore. Most of the storyline entails dealing with one conflict after the next. What I often liked about the Dragon Age franchise was the ability to explore situations rather than always have to immediately deal with the repercussions of them. For instance, the Qunari are a big threat in Dragon Age II, but I never felt I was given enough time to explore what is obviously a deep culture. I wanted to interact with their leader on a larger basis rather than just from his seat in his square of the city while he condescended to me. I would have loved to interact with him in other instances to see the story from more than just one angle. It often feels like BioWare took too much on their plate to give each storyline component the depth it deserved. Another aspect of the franchise I have always appreciated has been the development of relationships during your journey. Fortunately, there still are a slew of companions for you to interact with. You are constantly interacting with characters who have entirely different back stories than yours. While this is a single player game, this experience feels social. However, as intriguing as the side dialogue between characters is and as compelling as entering a romantic relationship with a companion of your choice can be, there weren’t enough interactions with them. In Dragon Age: Origins, you could interact with all of your companions as you chose in one location: the camp. Dragon Age II is less accessible. You’ll have to visit your companions in their respective bases. While this arguably adds to the experience of visiting your friends, one site to visit them all would have encouraged multiple visits. BioWare definitely has a knack for creating believable, in-depth relationships between the main and companion characters. Varric became a very close friend of mine, as we shared a love for banter and sarcasm. Fenris, on the other hand, despised me and my ideals. As a mage, I of course had to stand behind the advocacy for my people’s rights. Fenris, being completely against the mages and a supporter of the Templars, adamantly hated me. Of course, this didn’t exactly stop our relationship. It impressively just made it more complicated. There are no black and white rules in Dragon Age II, and you are free to mold the story to your desires. I do wish that BioWare went the route of Mass Effect 2 and re-introduced characters from the first title. Although you can meet with some characters from Origins - like Zevran, which was a great choice to revisit - your interactions with them are brief and limited. Although I understand the appeal of introducing fresh new characters to entice players with, there is something much more impressive about maintaining my interest in an already-introduced character to reveal more substantial characteristics about them. Yet another design flaw holding back the experience of Dragon Age II was the inability to save before an important cut scene. Something I loved to do in Dragon Age: Origins was revert to previous saves to experiment with how conversations would pan out. 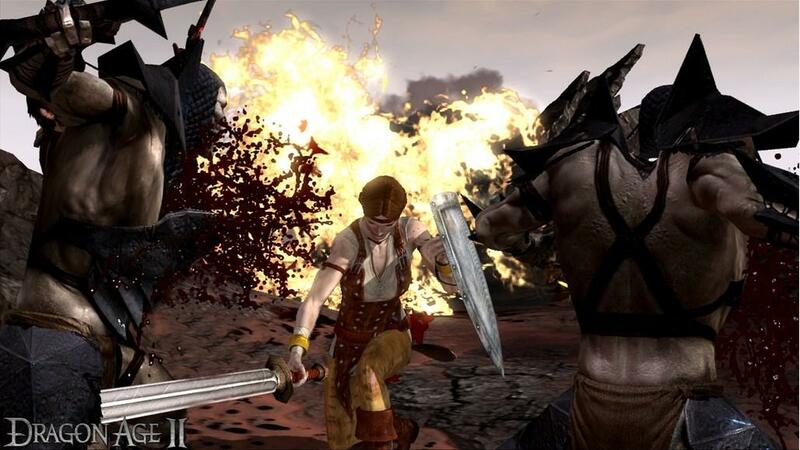 Unfortunately, many of Dragon Age II’s cut scenes occur immediately after battle. If you’re quick enough, you can often save right as the battle is ending and the cut scene has yet to begin. Otherwise, you are not given a chance to go back if a conversation does not go the way you wanted it to. 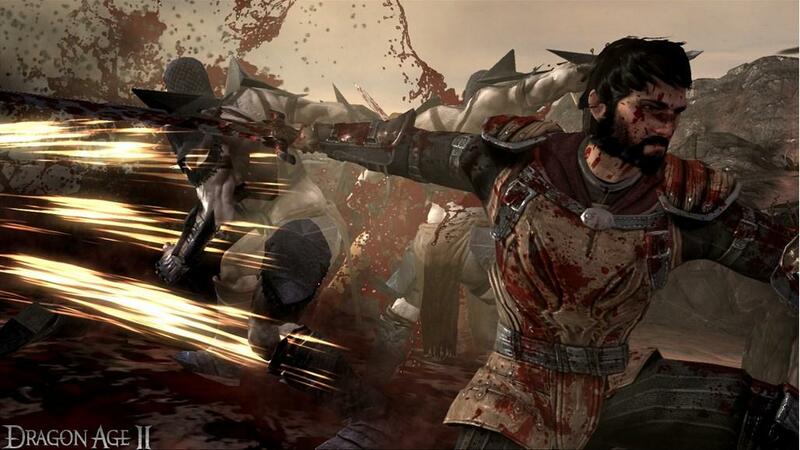 Even the action elements to Dragon Age II felt more bothersome than challenging. Enemies appear from thin air, and surround you in packs. After this wave is complete, you’ll typically be immediately confronted by another wave of enemies. Rather than feeling a sense of accomplishment over having just orchestrated a well-thought out battle plan, you’re immediately bombarded with a practically identical wave of enemies. I always opt for playing as a character with some sort of magic-like abilities because I am always interested to see what unique spells a developer can come up with. 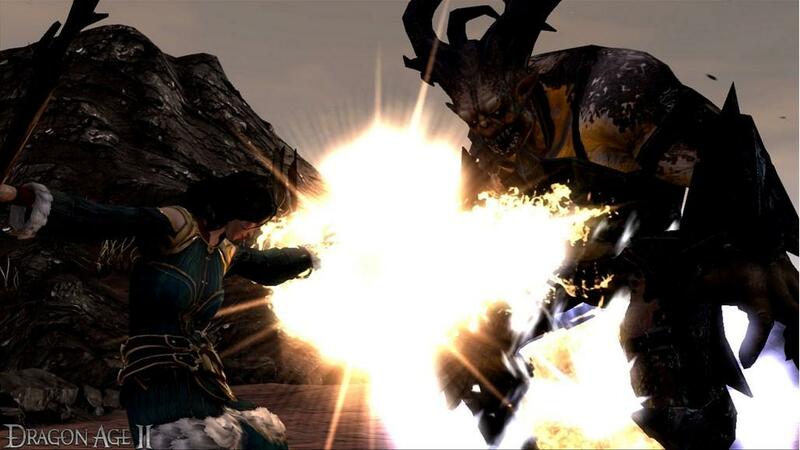 Although you can experiment with everything from elemental damage to blood magic playing as a mage in Dragon Age II, I often felt jealous of my enemies and their abilities like being able to teleport distances. This jealousy did nothing to make battles more intriguing. There are many instances where polish time would have benefited DAII greatly. For instance, speech isn’t as fluid as I would have liked it to be. There is a very obvious pause between when one character speaks and the other attempts to cut him/her off. Almost every cut scene I viewed was blemished by animations glitching in and out of focus. Opening up your scroll wheel becomes an entirely new disruptive experience. It would often glitch and remain on screen even after deactivating it, or abilities would not be selected. Targeting specific enemies while on pause from the battle within the scroll wheel is also clumsy and inaccurate. It often wasted time during battle and therefore decreased the intensity of it. BioWare’s Dragon Age II has a lot of good ideas. A social conflict between mages and Templars, struggle for power, ancient relics with mysterious powers, etc. Unfortunately, it seems that BioWare wanted to cram in more content than it could bring together in a cohesive, thought-provoking manner as they did in Origins. Furthermore, although the team opted for a more action-oriented gameplay to their RPG, the engrossing, challenging battles that were expected were replaced instead with tiresome and repetitive ones. Regardless, exploring character relationships and having the power of deciding the outcome of your storyline does Dragon Age II a great service. Ultimately, the decision of whether or not you will enjoy this game comes down to your preferences. Flaws and all, I still thoroughly enjoyed learning more about the Dragon Age universe and the unique characters that make up parts of it. Faulty game mechanics and disappointing maps, combat scenarios and storyline direction aside, Dragon Age II still has a surprising amount of intrigue hidden beneath the blemishes. The depth of character relationships, as well as the complex nature of the world of the Dragon Age franchise are a savior to a game that would otherwise forever be remembered by its mistakes.